WASHINGTON (CNN) - House Democrats split sharply over the issue of health care reform Friday as negotiations between a committee chairman and party conservatives broke down. A key leader of the party's conservative faction later warned the party leadership not to ram the current version of the health care bill through by circumventing the traditional legislative process. The escalating tension within the ranks of House Democrats raised new questions about the bill's prospects. House Energy and Commerce Committee Chairman Henry Waxman told reporters on Capitol Hill that he is willing to keep talking with members of the Blue Dog coalition - an influential group of fiscal conservatives - but also made clear he intends to move forward with the legislation. "We're not going to let (the Blue Dogs) empower the Republicans. I don't see any other alternative," he said. Waxman's committee is one of three House committees that is supposed to clear the health care bill; the other two have already done so. Legislation is typically approved by the relevant committees before being considered by the full House. On rare occasions, however, House leaders can remove a bill from a committee and bring it directly to a vote by the full House. "I think it would be a huge mistake if they removed the bill ... and simply (took) it to the House floor," he said. Ross is one of seven Blue Dog Democrats on Waxman's committee. Combined with the Republicans, they have the votes to prevent the committee's passage of the bill. "We're not empowering Republicans," Ross insisted. "We're trying to save this bill and save our party. ... We're every much Democrats as anyone else that's on the committee." Ross appeared to be backed by House Majority Leader Steny Hoyer, who said that he was "looking forward" to the committee passing a bill. "We expect the committee to be able to work its will," said Hoyer. Several Blue Dog members have expressed concern that the current version of the bill does not do enough to rein in health care inflation. They've also expressed disagreement with the bill's government-funded public health insurance option and its $1 trillion price tag. Ross and Waxman held a "very good meeting" on Friday, a Waxman aide said, and talks are continuing. A Democratic leadership aide told CNN that Waxman and Ross apologized to each other after their meeting for the back and forth on Friday and said they will continue to talk on Monday. The aide asked not to be identified speaking for either member. Bills considered so far by various House and Senate committees include Democratic proposals for a public option, mandates for people to be insured and for employers to provide coverage, and an end to lack of coverage due to a pre-existing condition. Republicans oppose a government-funded option and any requirement for employers to provide coverage. They also call for limits on medical malpractice lawsuits, which Democrats don't favor, along with a number of provisions contained in the Democratic bills, including increased efficiency in Medicare and Medicaid and a focus on preventive health programs. "Let's not rush it. Let's slow down. Let's get it right and ensure that the American people get the kind of health care that they need and deserve," Ross said Friday on CNN's "American Morning." He later noted that only one out of 10 items on the Blue Dogs' list of concerns had been sufficiently addressed, despite meetings over the past few days with Obama and White House Chief of Staff Rahm Emanuel. Ross reached an agreement with Obama and Waxman on Tuesday to create an independent council to set Medicare reimbursement rates as a way to help hold down costs. "Unfortunately, we have failed to reach an (overall) agreement," Ross said. The public bickering over the bill raised new questions over the status of the legislation. "It's not just the seven of us on the Energy and Commerce Committee that are conservative Democrats that have concerns with the bill," he said. "It's almost the entire Blue Dog coalition, and I can tell you if (the Democratic leadership tries) to bring it up for a vote on the House floor, it would be a mistake," said Ross. On Thursday, the top Democrat in the U.S. Senate said his chamber won't vote on a health care reform bill until after the upcoming August recess. The announcement by Senate Majority Leader Harry Reid went against President Barack Obama's stated timetable for both the House and Senate to turn out bills before the August break. After Reid's statement, Obama said he would accept a delay so long as work toward passing a bill continued. On the House side, Pelosi reiterated Thursday that she wants the chamber to vote on a bill before the August break. On Friday, however, Hoyer hinted that Pelosi's timeline could slip. "We're going to work until the bill is done," Hoyer said. But "that doesn't mean we're necessarily going to work in session." Obama met with Reid and Senate Finance Committee Chairman Max Baucus at the White House Friday to discuss the state of the controversial bill. Updated at 8:00 p.m. EDT with additional information. The milleniers like myself and generation X-ers, like President Obama are going to leave our country and planet in a far better situation than all of you baby boomers whom went from flower power to Regan foot soldiers. It's true that us Democrats have a lot of power right now, but once the new generation of Republicans sees the light in a year or two, they are going to have a large roll to play in all of this. But it certainly isn't going to come about by calling us Socialists. 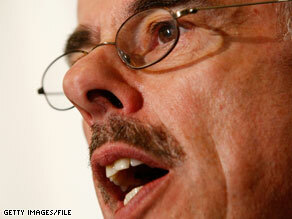 Waxman has got to be the uglist man on the planet. It figures he's a liberal. It's not about healthcare...................it's all about CONTROL. Bravo to the Blue Dogs. They are trully represnting the people that voted for them. They are trying to comprimise to pass a bill that will help the American people gain access to affordable health care. To those that call them obstructionists, I would say you are mindless minions. Fix health care, don't destroy it!!!!!!!!! Typical Democrats. They turn on each other and all forward progress goes to the wind. I agree-get Hillary back to the Senate, if only part-time weekends! They'll listen to you this time!!! The Blue Dogs Democrats are just Repulicans, calling themselves Democrats. They are racist, who think that only minorities will benefit from health care reform. They don't think that whites need this as well as minorities or they only care about the rich like it's always been said. The other thing is and proberly the main thing, they don,t want President Obama a Black President to get credit for health care reform , just like the Republicans who are not afraid to call themselves Republicans, or to let people know they are racist. sounds just like the worthless democrats that idiots have put there. such a crying shame. this country is in serious trouble. Waxman, Pelosi, Clyburn, Rangel are all devils. They want to destroy America. They want to follow radical agenda of Barack Obama. We will have tough time to bring our economy back and also private health insurance. I hope the voters will vote them out. Our country is in in-experienced hands. This is On The Job Training. HR3200 Senator Max Baucus's health care push is a bill written with the medical industry influence over congress. Yes, I have read it! What did you expect from doctors and hospitals and insurance co. I do like the clinics and new doctors though. In 1945 the progressive movement introduced a single payer public plan for health care reform. The medical industry and congress has blocked single payer public plan year after year. Hopefully this will be the year of Universal Health Care! Call congress and Support Single Payer Public Plan to be included in the health care reform bill. If the Democrats cave on this, it will be their own fault. The Republicans will pounce on this if nothing is passed. Dems wanted the power, they have it and still cannot get anything done. Term limits please. Too much money bought these politicians. Lets just keep looking out for the insurance companies guys. I hope the democrats burn themselves! Thank goodness for conservative democrats. If they were all like Pelosi we'd be in deeper trouble than we are. They need to take their time on this and get in right in the beginning. NOpublicans should help not simply hinder this process. Come on folks. A bad bill is a bad bill. We cannot keep spending if we have no way to pay the deficit. I live within my means. I don't have ONE big screen. Quit expecting someone else to pay for you. I think health care reform is 25 years over due. America is looking like a country of fools to the rest of the world. pass the health care bill already. HAHAHA! LOVE IT! Just further proof that Republicans and the GOP are irrelevent. The Democrats are diverse enough to represent the full spectrum of the American people. The Government can't run Medicaid, Medicare or Social Security...you want to to trust them to run a universal health care system?! If they are telling us it will cost 1 – 1.5 trillion you better believe that the real figure is at least 3 – 4 times as much. In the end we will ALL be paying more in taxes than we would to private health insurers. Hey dems, go ahead – rush and ram current healthcare reform bill through, then kiss your seats bye bye in 2010 n 2012. The only reason the Democrats have control of the house is because they now include conservatives. The mix in the country has not changed. Remove the conservatives, purify the party and become marginal again. You can tell when someone runs out of a reason by how quickly they start speaking for the people. I do not think heath care is broken, I think this is a big push to cover up the coming medicaid & medicare meltdowns. When Obama says it is about the economy that is what he really means. Look at California is that how we all want to be in 5 years? Let the blue dogs wither on the wine and parish. DNC as well as house leadership should seriously consider not providing any assistance to these blue dogs come 2010 and beyond. Let them join rank and file GOP thugs. I was always told, you don't get something for nothing. This proposed legislation of healthcare will cost everyone in this country, and not just pennies. Medicare and Medicaid are fine examples of how Government runs things. If the Congress really wants to fix the problems with the healthcare industry, why don't they start with tort reform? Stop the outrageous awards in medical malpractice cases. Maybe put a cap on malpractice premiums for health care providers. Regulate the insurance industry; stop the practices insurance companies use to avoid paying legitimate claims or deny coverage based on pre-existing conditions. Make medical school more affordable, through government scholarships paid back by service. That was done in the past, when doctors and nurses did not have to worry about making money to pay for their education more than caring for people.